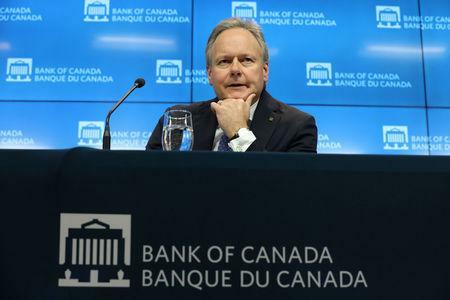 OTTAWA (Reuters) - Bank of Canada Governor Stephen Poloz on Wednesday said the Canadian economy is in good shape, although low oil prices are delivering "a material shock" that would cut growth this year. Poloz, speaking to Bloomberg Television at the World Economic Forum in Davos, Switzerland, also reiterated that the pace of future interest rate hikes would be heavily dependent on data and how the economy responded to the challenges posed by weak crude prices and global trade worries. The central bank has raised rates five times since July 2017 but indicated on Jan. 9 that the pace could slow. "The economy is in good shape - we've got a couple of things we are dealing with, low oil prices for one ... so that's become a material shock," he said, noting the bank has cut its 2019 growth forecast to 1.7 percent from 2.1 percent. Poloz repeated the bank's view that the economy could strengthen if current global trade tensions ended. "We think of it as a two-sided risk: it would be a disaster if the whole situation escalated but it would also be very positive if it were resolved," he said.